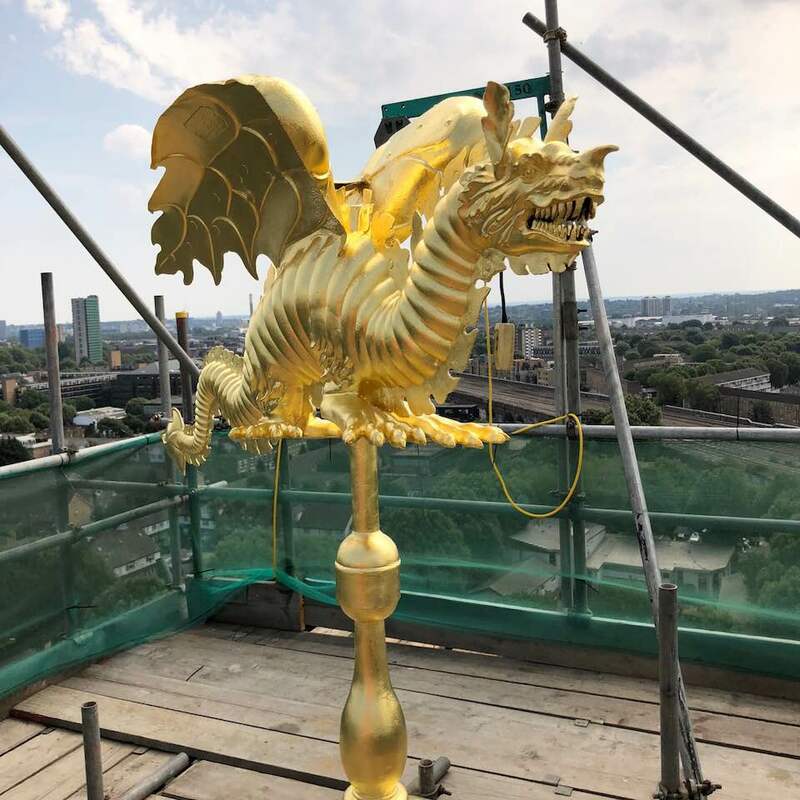 A three dimensional model of the St James dragon was made by the restorers during the recent retoration of the weathervane - and here is a video displaying it to its full glory. 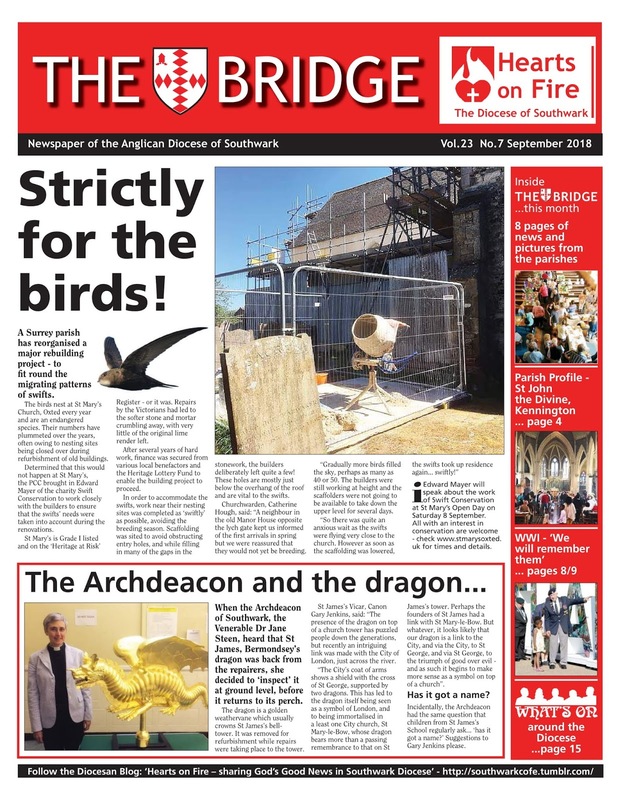 The Bridge, newspaper of the Diocese of Southwark, carries an article on its front page of its September issue about Archdeacon Jane Steen's visit to see the Bermondsey dragon. Congratulations to Barry and Harriet, married today at St James. Every blessing to you both and to all the family. 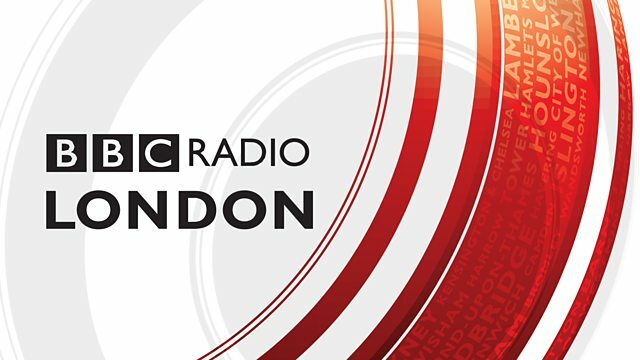 Fergus Carr, the architect of our proposed new joyslide for the 21st century and local historian, Graham Taylor, have been interviewed on BBC Radio London about our plans for the new slide. Above: the newly restored ceiling of the portico of St James, revealed as the first tranche of scaffolding comes down. 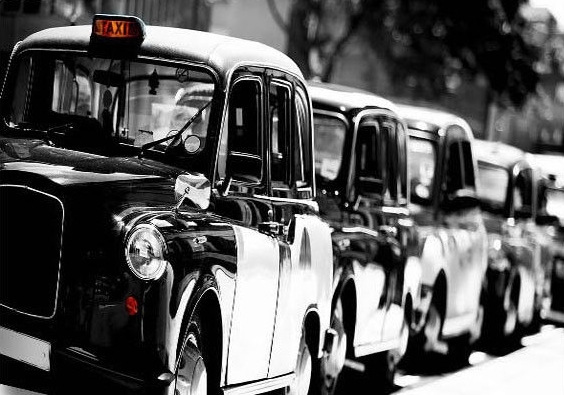 As the son of a black cab driver, I always enjoy meeting cabbies or cabby's families at weddings or funerals that we take as a team here in Bermondsey. Clearly over the years Bermondsey has produced a lot of cab drivers. At funerals, John 14.1-6 ('in my Father's house are many mansions') is a favourite bible reading for funerals. 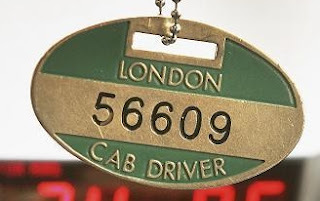 When I've got a cab driver in the congregation, I say that a London cabbie always knows the way. He is the man with the knowledge. 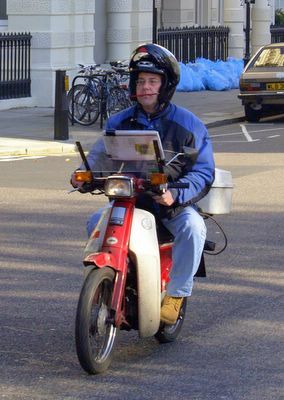 He has toured the streets on a moped with a clipboard, subjected himself to dozens of verbal examinations, and is finally awarded his 'badge' when he has completed 'the knowledge'. I can remember my dad doing the knowledge, with maps spread out over the kitchen table, the visits to the Public Carriage Office to be quizzed by the examiners, and the day he came home with his Badge (left), the license to ply for hire on the streets of London. Just as you can trust a London cabbie to take you to your destination - because he has the knowledge - so you can trust Jesus, the Son of God with The Knowledge, to guide you to the Father's house. The moral is simple: follow the Man with The Knowledge. As part of the restoration of the church tower and portico, we have received the go ahead to replace the currently veryfaded Scriptural Panels on the west front of the church, with brand new ones that will proclaim God's word to the hundreds of people who walked through St James's Churchyard each day. 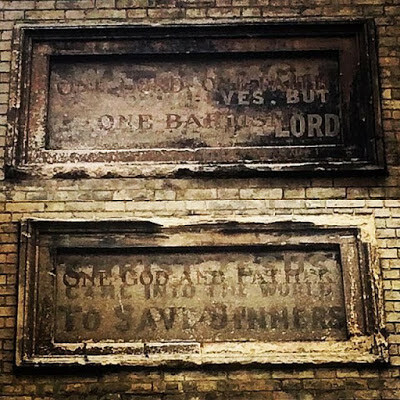 The old panels were badly corroded and scarecely readable. 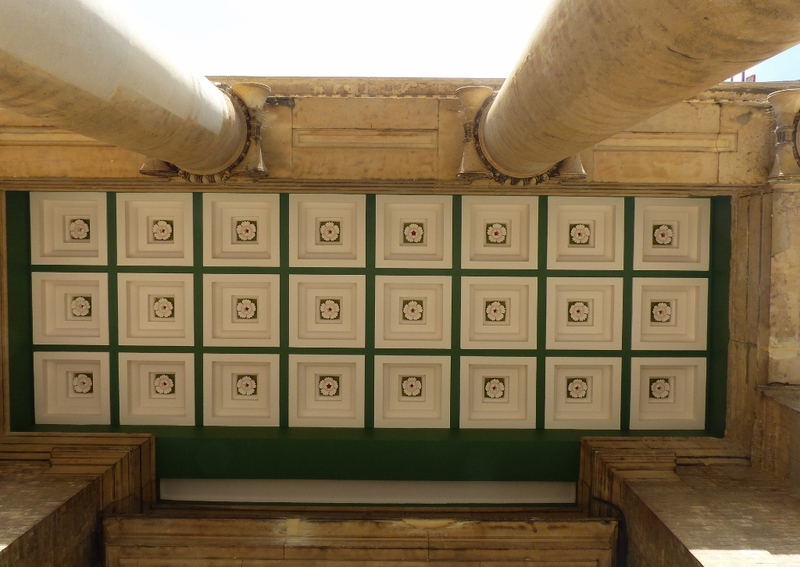 Now the surrounding stonework is to be repaired and new panels installed. 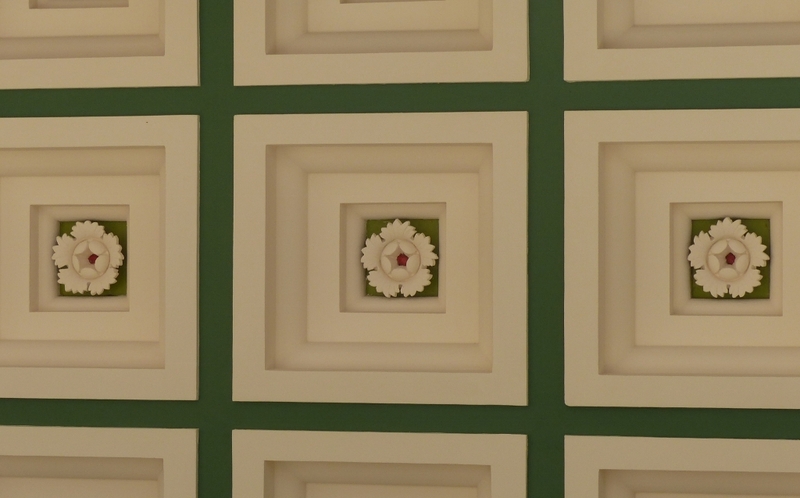 The existing signs consist of two sets of Scriptural Texts, one written over the other. Rather than choose between them we have opted for two new texts. One declares who Jesus is 'I am the way, the truth and the life' ; and the other presents the invitation that he gives to all people to come to himself ('Come to me and I will give you rest'. 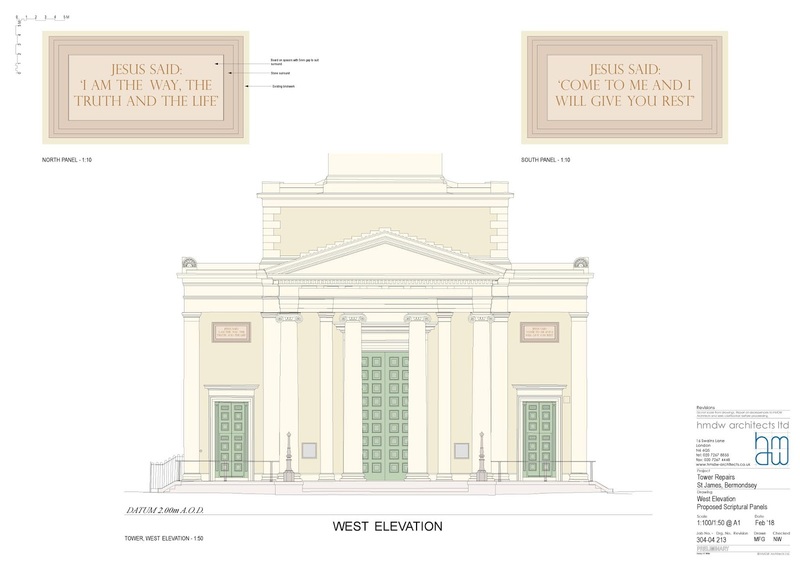 It is a happy thought that God's message will be proclaimed with fresh clarity from our building, once the restoration work is completed in the early autumn. 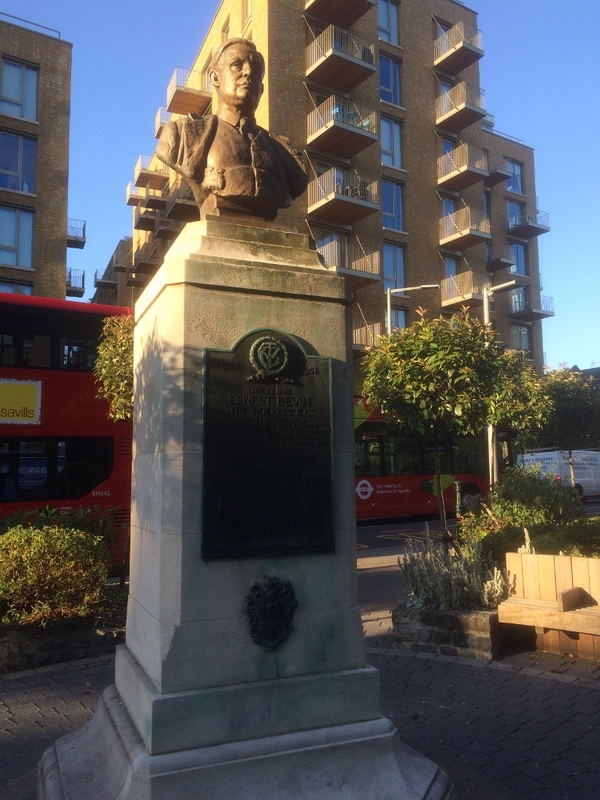 On Tooley Street, close to the junction with Tower Bridge Road, is this statue of Ernest Bevin, a hero to the dockers who lived and worked locally in the heyday of the docks. Bevin left school at 11 and went to work as a labourer. He was an orphan at 12, a union leader at 25, the founder of the TGWU at 41, a leading member of the wartime coalition headed by Winston Churchill at 59 (he served with distinction as Minister of Labour), Foreign Secretary in the Atlee government at the age of 64. He died in 1951. When appointed to Churchill's government he was not actually an MP, but a vacancy was found for him and he was elected unopposesd to the constituency of Wandsworth Central. 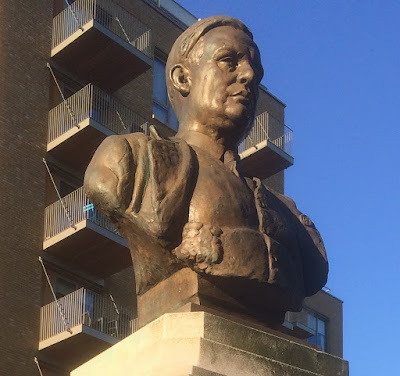 Years later the naming of Ernest Bevin School in Tooting (where I taught science in the early 1980s) commemorated his links with that part of London. Bevin was renowned for his championship of working people, for his patriotism, and for his courtesy and respect towards all people. His biographer, Mark Stephens, believes one of the influences that most shaped Bevin were his deep Christian convictions. At the age of 19 he was baptised by immersion in the Bristol baptist church where he was involved in visiting the sick, helping to run the Sunday school, distributing tracts and speaking at open air meetings. As a 26 year old man Bevin wrote in his Bible: 'This evening Sept 18th 1907 I have resolved By the Grace of God to serve him where ever he may call me, may God keep me and guard me until he shall call me home. 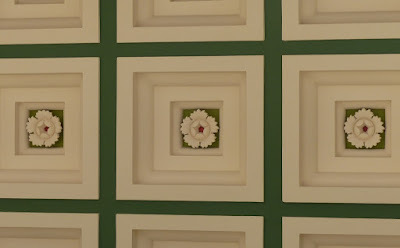 'His daughter recalls that the Bible in which he inscribed these words was kept by his bedside throughout his life and he read from it every night. Was that the secret of Bevin's success - this unskilled labourer who became a world statesman? 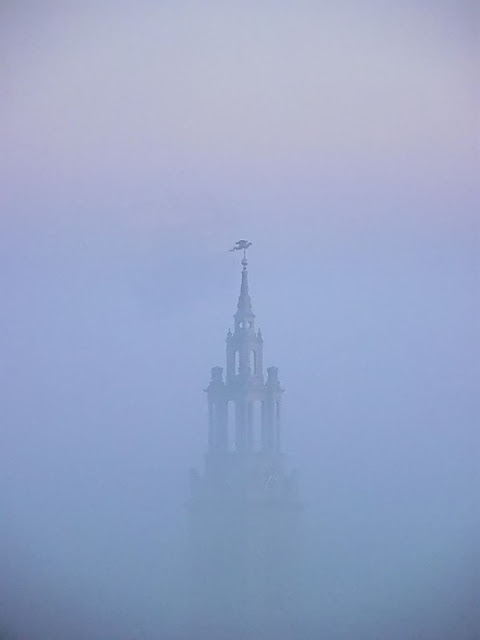 The dragon, newly repaired and regilded, has returned to its traditional perch on the top of the bell tower. 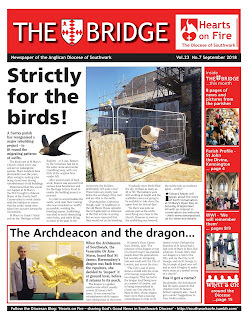 Our thanks to Dorothea Restorations for all their hard work and skill in repairing this Bermondsey landmark. Great news! Our plan for a new joyslide for the 21st century has been granted planning permission by Southwark Council. We are so grateful to architect, Fergus Carr (right), who has give so much time, energy, and creativity to this project. Fergus is the great great grandson of Arthur Carr, chairman of Peek Freans biscuits, who was the orginator of the first joy slide. 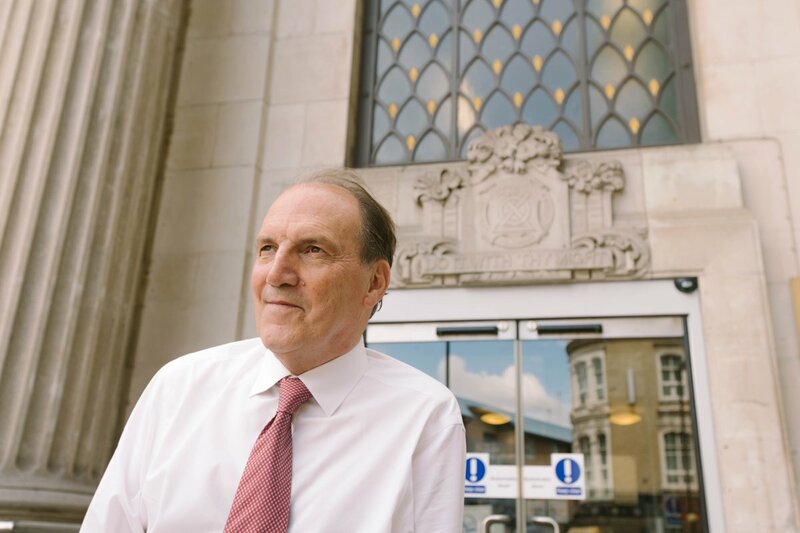 Congratulations to Sir Simon Hughes on his appointment as Chancellor of London Southbank University. 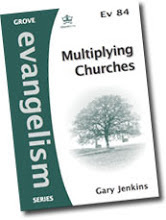 For two summers in the late 1970s I was a guide in York Minister as part of an outreach to tourists run jointly by the University Christian Union and nearby St Michael-le-Belfrey, the York church that many of us attended. 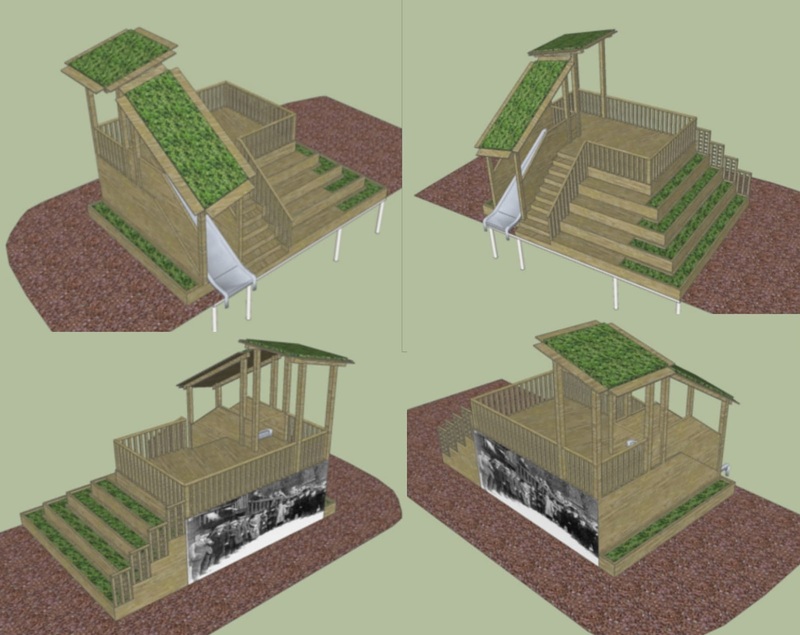 Our task was to bring out the spiritual meaning of the building. 'Whatever you do, talk about the faith' one of the Minister canons instructed us at our briefing. 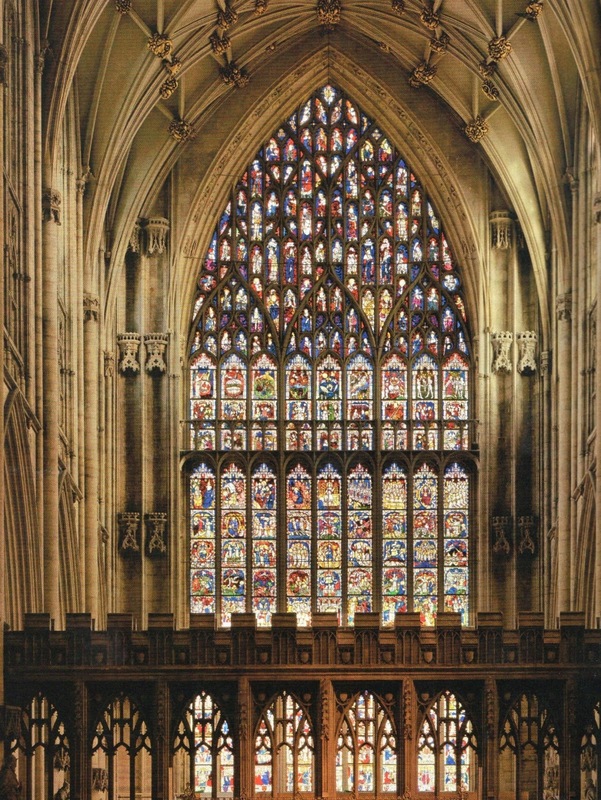 Ever since I have loved that building and so when I received for my birthday this year a new book about the Great East Window of York I was in my element even if my daughter considered that (even by my standards) it looked like a really boring book. 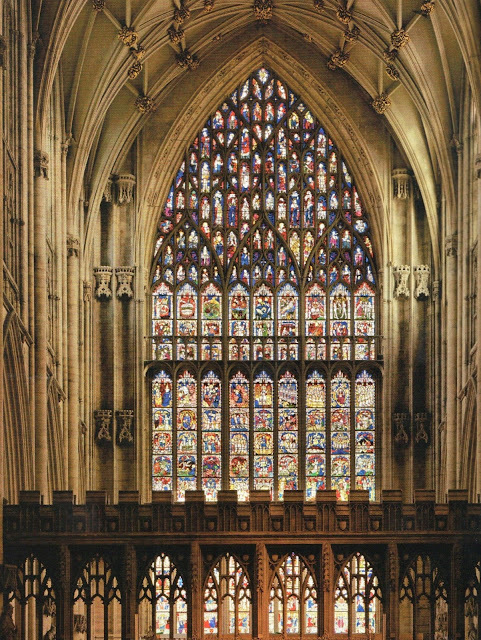 The Great East Window is the largest expanse of Medieval stained glass in England. 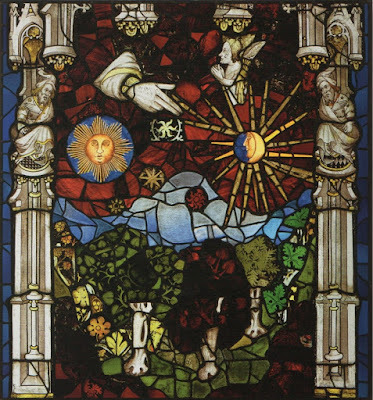 It was constructed between 1406 and 1408 by the Coventry glazier, John Thornton, who was instructed 'according to his best skill and Cunning' to complete the work within a period of three years. He did. 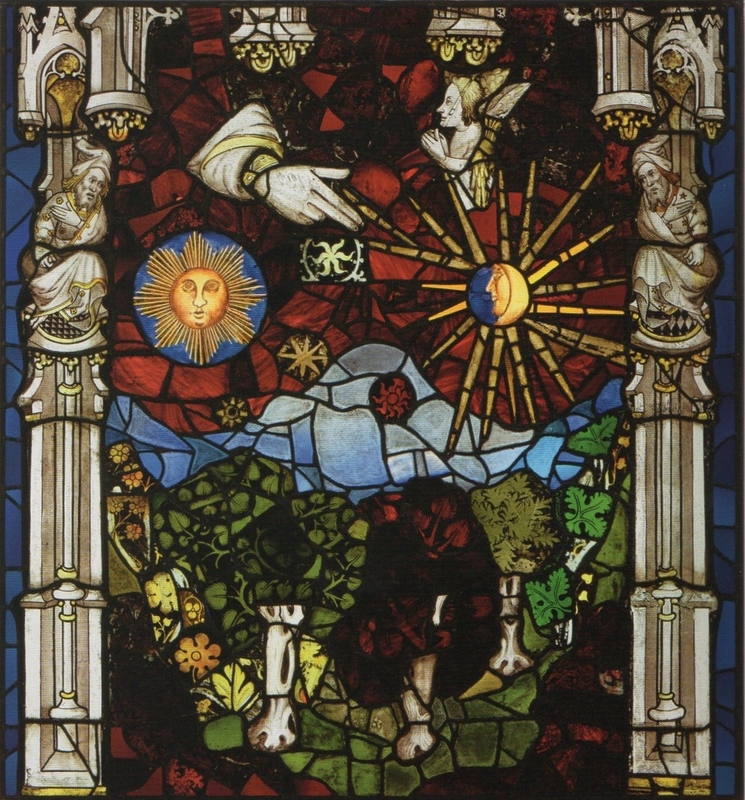 The theme of the window is the story of the Bible. 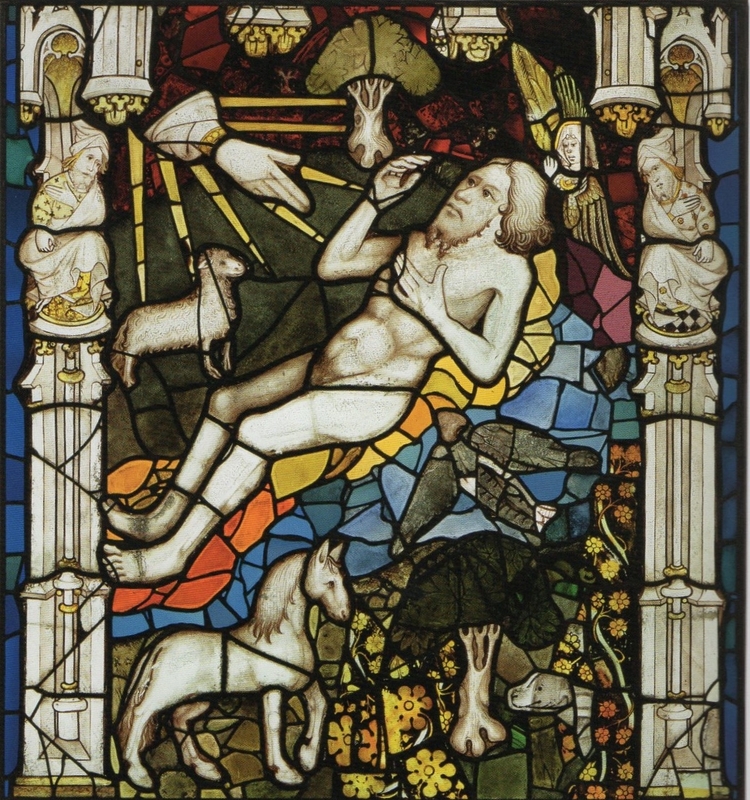 It begins with the story of the Old Testament, from creation, through Noah, Abraham, and Moses to David, and then fast forwards to the book of Revelation which is the subject of the bottom two thirds of the window. 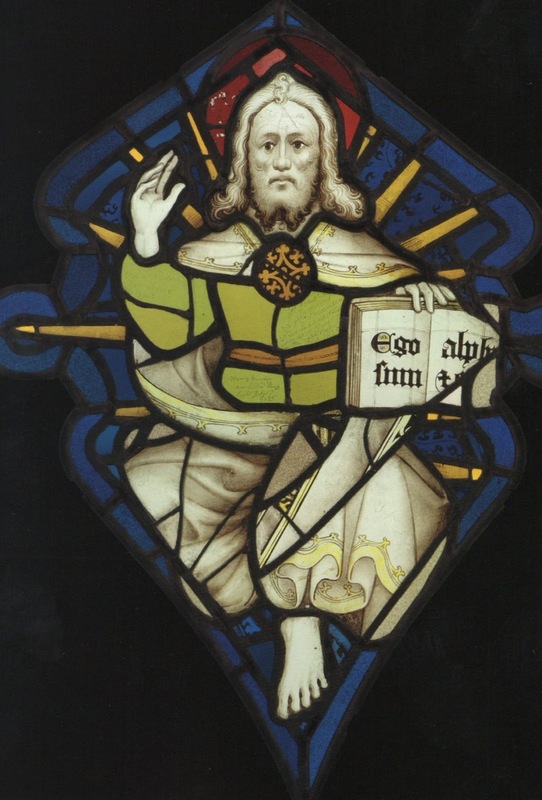 Presiding over it all, at the apex of the window, is the Lord God and the words 'I am the alpha and the omega' from Revelation 1.8 (pictured above).